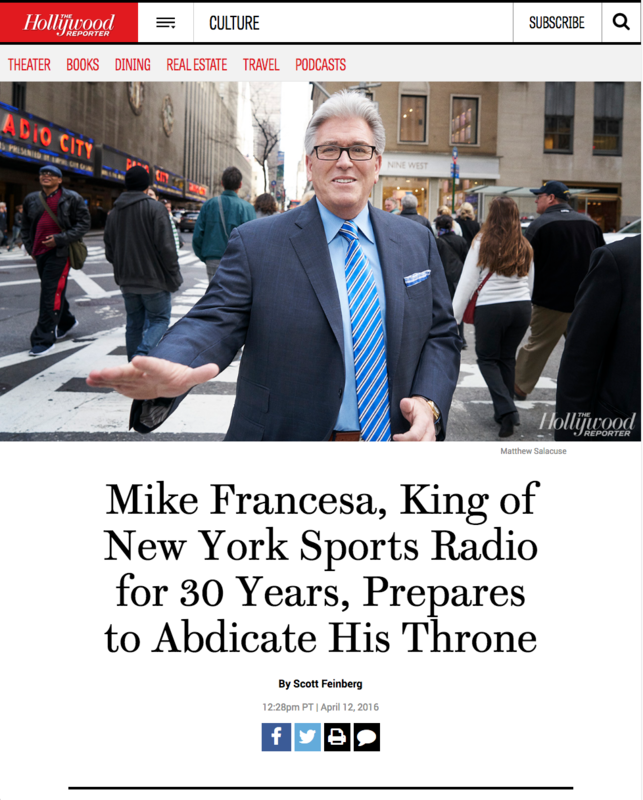 Excerpt from "Mike Francesa, King of New York Sports Radio for 30 Years, Prepares to Abdicate His Throne"
"There are plenty of Francesa haters. The website Deadspin seems to exist solely to mock him, especially during the years when his show was simulcast — first on the YES Network and then on Fox Sports 1 — and they posted clips of him being pranked by callers (one asked, "Who has lower expectations on a nightly basis, the Islanders or your wife? "), endlessly repeating himself (Google "Mike Francesa and Brandon Inge") and, famously, falling asleep on the air (he still refuses to acknowledge that he was out). But there are also legions of Francesa fans who consider themselves members of "Mongo Nation," more than a few of whom have told him that he's been more of a presence in their life than their father — something that hits home for Francesa because when he was 7 his own father abandoned him, his two brothers (one later took his own life) and their mother. In 2014, a few Mongos organized FrancesaCon, a bar crawl on the Upper East Side, and thousands showed up, many coiffed and dressed like their hero (who, incidentally, has all of his clothes made for him by Madison Ave. haberdasher David Lance). The gathering became an annual affair to raise money for charity, and Francesa has shown up at each subsequent installment, received like a god. "It's the most enjoyable outing I've ever been to," he gushes. "I wish everyone could get that kind of ovation in their life."